38P/Stephan-Oterma – Halley family comet 38P/Stephan-Oterma has an orbital period of ~38 years and is returning for the first time since 1980. This comet has a bit of an interesting backstory. In 1867, it was first sighted by Jérôme E. Coggia (Marseilles, France) who thought he had found an uncatalogued nebula. Over the following nights, followup observations by E. J. M. Stephan (Marseilles, France) uncovered the true nature of the object. For some reason, the discovery announcement cited Stephan as the discoverer with no mention of Coggia. After being missed at its next return in 1904, the comet was photographically rediscovered in 1942 by Liisi Oterma (Turku, Finland). 46P/Wirtanen – The brightest comet of the year will be 46P/Wirtanen which passes within 0.078 AU of the Earth in mid-December. 64P/Swift-Gehrels – Comet Swift-Gehrels was originally discovered visually by Lewis Swift (Rochester, New York) in 1889. Swift was also the discoverer of the Perseid parent body, Swift-Tuttle. After the 1889 apparition Swift’s comet went unobserverd until 1973 when its was rediscovered by Tom Gehrels on photographic plates taken at Palomar Observatory in southern California. 2018 marks Swift-Gehrels’ 7th observed return. Since its discovery in 1889, the comet’s orbit has been fairly stable with an orbital period of 9.4 years and perihelion distance near its current value of 1.39 AU. Not an especially bright object, this year’s return will be its best known return with a minimum Earth-comet distance of 0.44 AU on October 28. You will have to wait till 2092 for another return as good as this year’s though the 2046 return will be just a little worse than this year. T = 2018-Nov-03  q = 1.39 AU   Short-Period comet  Period = 8.9 yr.
C/2016 M1 (PANSTARRS) – Comet C/2006 M1 (PANSTARRS) continues to slowly fade. 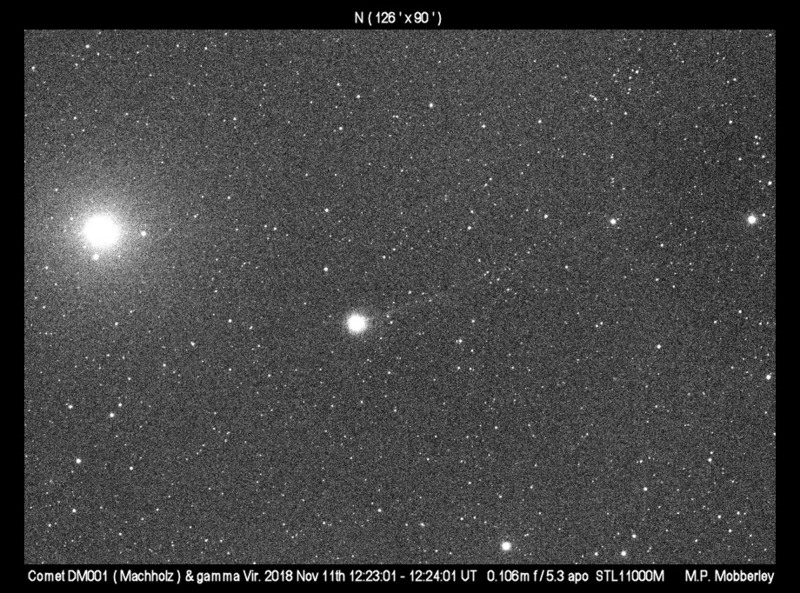 Visual observations by Chris Wyatt on November 3 found the comet at magnitude 10.4. Having passed perihelion on August 10 at 2.21 AU and now moving away from both the Earth and Sun, C/2016 M1 should continue to slowly fade as it moves through the southern constellations of Circinus and Apus. C/2016 N6 (PANSTARRS) – Yet another faint, high q, PANSTARRS discovery, C/2016 N6 was imaged by Raymond Ramlow at magnitude 12.6 on November 2nd and observed visually by J. J. Gonzalez at magnitude 11.8 on October 20. The comet is now 4 months past perihelion (2.67 AU on July 18, 2018). A decreasing Earth-comet distance will result in the comet staying near magnitude 12 even though it is moving away from the Sun in November. (944) Hidalgo and (3552) Don Quixote – Two bright low activity or dormant comets come to perihelion this year. (3552) Don Quixote is still designated an asteroid even though a tail was seen in 2009 with the Spitzer IR space telescope and again this March at visible wavelengths with a 4.1-m telescope. This month Don Quixote is fading from magnitude 16.5 to 17.2. (944) Hidalgo reaches peak brightness at magnitude 14.3 this month. Unlike Don Quixote, Hidalgo has shown no cometary activity so far. This month will up to four comets as bright or brighter than 10th magnitude. 21P/Giacobini-Zinner will fade from 7th to 9th magnitude as it rapidly moves south. As 21P fades, the next bright comet, 46P/Wirtanen, quickly brightens to take its place. In addition to 46P, comets 38P/Stephan-Oterma and 64P/Swift-Gehrels brighten to near or slightly brighter than magnitude 10.0. 21P/Giacobini-Zinner – Short-period comet 21P/Giacobini-Zinner starts the month as the brightest comet at magnitude ~7.7. Now a few weeks past perihelion and its closest approach to Earth, 21P will be fading this month and should hand its ‘brightest comet’ title to 46P/Wirtanen towards the end of the month. G-Z has provided observers with a number of memorable views as it traveled through the star, cluster and nebula-rich winter Milky Way. October will be no different as it moves southwards through Monoceros (Oct 1-9) and Canis Major (9-31). Close approaches to the following deep sky objects occur this month: open clusters NGC 2311 (Oct 3), M50 (Oct 6/7), NGC 2335 (Oct 8), Cr 465 (Oct 8/9), NGC 2343 (Oct 8/9), NGC 2345 (Oct 11), NGC 2360 (Oct 14). CCD images have shown a nice long dust tail. Observers are encouraged to watch the evolution of 21P’s dust tail as we pass through orbit plane crossing on October 9th. Visual observations submitted to the ALPO over the last week or so show 21P to be between magnitude 7.4 and 7.6. This suggests the comet is running a little fainter than expected. Then again the Moon had been bright and/or nearby and possibly hid the outer extent of 21P’s coma resulting in fainter estimates. 38P/Stephan-Oterma – Comet Stephan-Oterma has an orbital period of ~38 years and is returning for the first time since 1980. This comet has a bit of an interesting backstory. In 1867, it was first sighted by Jérôme E. Coggia (Marseilles, France) who thought he had found an uncatalogued nebula. Over the following nights, followup observations by E. J. M. Stephan (Marseilles, France) uncovered the true nature of the object. For some reason, the discovery announcement cited Stephan as the discoverer with no mention of Coggia. After being missed at its next return in 1904, the comet was photographically rediscovered in 1942 by Liisi Oterma (Turku, Finland). This month, 38P will be a morning object in Orion and Gemini as it brightens from 11th to just brighter than 10th magnitude. Ultimately the comet will peak around magnitude 9.0 to 9.5 in late November after its perihelion on November 10 at 1.59 AU. In 1980, Stephan-Oterma approached to within 0.59 AU of Earth and brightened to between magnitude 8.5 and 9.0. This year’s return will be a little further away at 0.76 AU, hence the slightly fainter maximum brightness. 46P/Wirtanen – The brightest comet of the year should be 46P/Wirtanen which will pass within 0.08 AU of the Earth in mid-December. Wirtanen will be located around a southern declination of -30 degrees till late November (in the constellations of Cetus and Fornax). The comet will rapidly brighten from 11th to 8th magnitude this month. The comet will become better placed for northern observers starting in late November as it rapidly moves north. Assuming it behaves as it has in the past, Wirtanen should peak around magnitude 3 in mid-December. Note, that as a short-period comet, Wirtanen is likely to be a large diffuse object around the time of closest approach. It is possible its coma diameter will be in excess of 1 degree. Do not expect it to appear as bright as a 3rd magnitude star since it light will be spread over a large area. Observers may need a relatively dark sky to see Wirtanen with the naked eye. 64P/Swift-Gehrels – Comet Swift-Gehrels was originally discovered visually by Lewis Swift (Rochester, New York) in 1889. Swift was also the discoverer of the Perseid parent body, Swift-Tuttle. After the 1889 apparition Swift’s comet went unobserverd until 1973 when its was rediscovered by Tom Gehrels on photographic plates taken at Palomar Observatory in southern California. 2018 marks Swift-Gehrels’ 7th observed return. Since its discovery in 1889, the comet’s orbit has been fairly stable with an orbital period of 9.4 years and perihelion distance near its current value of 1.39 AU. Not an especially bright object, this year’s return will be its best known return with a minimum Earth-comet distance of 0.44 AU on October 28. You will have to wait till 2092 for another return as good as this year’s though the 2046 return will just a little worse. The magnitudes given below are based on 64P’s behavior during its 1981 apparition. Even considering its mid-August outburst, 64P seems to be running brighter than predicted. Observations submitted to COBS over the past few days show the comet to be between magnitude 10.1 and 11.4. C/2016 M1 (PANSTARRS) – Visual observations by Chris Wyatt on October 1 found the comet at magnitude 10.2. Having passed perihelion on August 10 at 2.21 AU and now moving away from both the Earth and Sun, C/2016 M1 should continue to slowly fade as it moves through the southern constellations of Centaurus and Circinus. C/2016 R2 (PANSTARRS) - CO+ rich comet C/2016 R2 (PANSTARRS) continues its very slow fade. Thanks to its large perihelion distance (2.60 AU), the comet experiences slow changes in its heliocentric and geocentric distances. The comet should remain around 12th magnitude this month as it pulls away from the Sun in the northern morning sky. (944) Hidalgo and (3552) Don Quixote – Two bright low activity or dormant comets come to perihelion this year. (3552) Don Quixote is still designated an asteroid even though a tail was seen in 2009 with the Spitzer IR space telescope and again this March at visible wavelengths with a 4.1-m telescope. This month Don Quixote is near magnitude 16.3. (944) Hidalgo is still inbound and will peak in brightness at 14.3 in November. Unlike Don Quixote, Hidalgo has shown no cometary activity so far. 364P/PANSTARRS – 364P/PANSTARRS is a low activity comet that only shows activity at small heliocentric distances. Discovered in 2013, 364P is making its second observed return with perihelion having occurred in late June at 0.80 AU. Cometary activity has now ceased though a residual dust tail is still visible. This month CCD observers will be able to image the bare nucleus of 364P as it fades from magnitude 17.7 to 19.3. [Note from the Comet Section Coordinator: For the past few months I have been posting these monthly summaries on the CloudyNights forum. Each monthly ALPO Comet News has its own forum page for observers and comet enthusiasts to share observations. Please check it out and join in the fun if so inclined. Here's a direct link to the September 2018 page. 21P/Giacobini-Zinner – Short-period comet 21P/Giacobini-Zinner will be this month’s brightest comet. With an orbital period of 6.5 years, 21P is making its 16th observed return since its visual discovery in 1900. This year 21P has an above average return as it will pass 0.39 AU of Earth on September 10 with perihelion also occurring on the that date. Only the returns in 1946 and 1959 were closer to Earth and not until 2078 will 21P be this close again. The image below is from Manos Kardasis and shows 21P and its sunward fan/jet on August 17. 38P/Stephan-Oterma – Comet Stephan-Oterma is returning for the first time since 1980. This comet has a bit of an interesting backstory. In 1867, it was first sighted by Jérôme E. Coggia (Marseilles, France) who thought he had found an uncatalogued nebula. Over the following nights, followup observations by E. J. M. Stephan (Marseilles, France) uncovered the true nature of the object. For some reason, the discovery announcement cited Stephan as the discoverer with no mention of Coggia. After being missed at its next return in 1904, the comet was photographically rediscovered in 1942 by Liisi Oterma (Turku, Finland). 46P/Wirtanen – The brightest comet of the year should be 46P/Wirtanen which will pass within 0.08 AU of the Earth in mid-December. Wirtanen will be located around a southern declination of -30 degrees till late November (in the constellations of Cetus and Fornax). The comet will brighten from 14th to 11th magnitude this month. The image below by Charles Bell shows 38P on August 15 during its recent outburst. C/2016 R2 (PANSTARRS) – CO+ rich comet C/2016 R2 (PANSTARRS) continues its very slow fade. Thanks to its large perihelion distance (2.60 AU), the comet experiences slow changes in its heliocentric and geocentric distances. The comet should remain around 12th magnitude this month as it pulls sway from the Sun in the northern morning sky. C/2017 T3 (ATLAS) – The most recent observation by Chris Wyatt placed Comet ATLAS at magnitude 12.3 on August 29. This is a good magnitude or more fainter than it should be and significantly fainter than it was on August 14 (magnitude 10.2). It will be interesting to see if the comet is really fading fast (or if a bright Moon-lit sky is to blame). Now over a month past perihelion, C/2017 T3 (ATLAS) should be fading though now the question is how rapidly. C/2018 N1 (NEOWISE) - C/2018 N1 (NEOWISE) was discovered by NASA’s low-Earth orbiting NEOWISE spacecraft on July 2nd at 16th magnitude. Earth-based observers quickly determined that NEOWISE was much brighter. The comet continued to brighten as it approached perihelion on August 1 at 1.31 AU and closest to Earth on July 27 at 0.31 AU. Chris Wyatt and Juan Jose Gonzalez estimated it to be around magnitude 8.3 to 9.5 by the end of July. The comet is in full retreat from both the Sun and Earth and should continue to fade from 12th to near 14th magnitude as it recedes back into the outer solar system. C/2017 S3 (PANSTARRS) – Last month we left C/2017 S3 (PANSTARRS) in a sad state. Being dynamically new and intrinsically faint, PANSTARRS was expected to disintegrate at some point either on approach to perihelion or not too long afterwards. After experiencing at least two outbursts on June 30/July 1 and July 15, the comet’s morphology and dust/gas production seemed to nosedive on the 20th. The last Earth-based images were taken on August 3rd and showed a diffuse object with no central condensation. As far as anyone could tell the comet’s nucleus had been severely disrupted. (944) Hidalgo and (3552) Don Quixote – Two low activity or extinct comets come to perihelion this year. (3552) Don Quixote is still designated an asteroid even though a tail was seen in 2009 and again this March. This month Don Quixote is near magnitude 16.3. (944) Hidalgo is still inbound and will peak in brightness at 14.3 in November. Unlike Don Quixote, Hidalgo has shown no cometary activity so far. 364P/PANSTARRS – 364P/PANSTARRS is another low activity comet, but only shows activity at small heliocentric distances. Discovered in 2013, 364P is making its second observed return with perihelion having occurred in late June at 0.80 AU. Cometary activity should greatly decrease or even cease allowing CCD imagers the opportunity to directly image its bare nucleus this month at around 17th magnitude. This month we may see as many as 4 comets become brighter than 9th magnitude. Two are located at far northern declinations while the other two will only be visible to far southern observers. C/2016 M1 (PANSTARRS) – The brightest comet of the past two months was well observed in June as it moved southwestward through Sagittarius and Ara. It was fun to watch it glide through such a globular rich part of the sky. By the end of June visual observers were estimating the comet to be between magnitude 7.7 and 8.7. CCD observations by Raymond Ramlow found a brightness that was closer to the brighter end of the visual range. Visual coma diameters ranged from 4′ to 8′ during the last week of June with CCD coma diameters as large as 13′. The comet is now located at a declination of -46 degrees, putting it out of range for most northern mid-latitude observers. For southern observers it will be located nearly overhead during the late evening. The comet will start the month near peak brightness but should slowly fade as the month progresses. Although perihelion isn’t till August 10, the fading is due to the comet is currently moving away from Earth. Since discovery S3 has shown little intrinsic brightening. That is until late June. Recent CCD images by Raymond Ramlow found the comet to be magnitude 12.3 on June 26. This is ~2 magnitudes brighter than predicted in last month’s ALPO Comet News. That prediction did come with the caveat that gas-rich comets may brighten at a faster rate as they get closer to the Sun. Whether the current brightness increase is due to the development of a larger gas coma is supported by an increase in CCD detected coma diameter from <1′ to 2.2-2.3′. S3 is only a northern hemisphere object as it is located close to and north of the Sun. It is circumpolar for much of the month though it is easier to observe in the morning. All observers are asked to observe this object as often as possible. Not only to watch its brightness trend but also to watch for signs of disintegration. Even after the 2 magnitude bump, dynamically new comets as faint as S3 have a high probability of disintegration as they near the Sun. 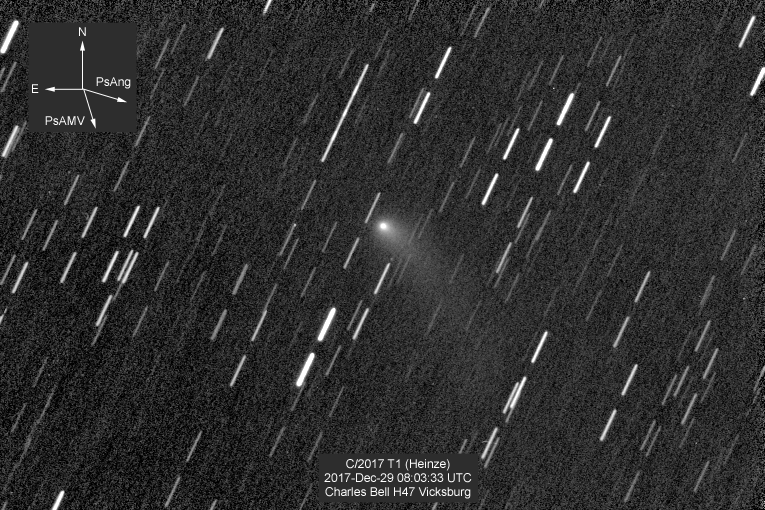 C/2017 T3 (ATLAS) - Out of view since April, Comet ATLAS was picked up again visually by Chris Wyatt. He observed the comet to be magnitude 9.4 on June 22nd and 8.8 on the 23rd. Ever since its discovery by the Hawai’i-based ATLAS (Asteroid Terrestrial-impact Last Alert System) project in October of last year, ATLAS has been brightening at a slightly faster than expected rate. The new observations show that it continues to brighten at a slightly faster than normal rate (2.5n ~ 12 compared to 2.5n ~ 10 which is usually, and often incorrectly, assumed for all long-period comets). The rapid brightening is not atypical for a dynamically old comet (one that has been through the inner solar system before). Perihelion occurs this month on the 19th at 0.83 AU though the comet will be a rather distant 1.4 AU from the Earth at that time. Peak brightness occurs towards the end of this month at between magnitude 8.0 and 8.5. For southern hemisphere observers, the comet will be visible at a low elevations (~10 – 15 degrees). Unfortunately, it will be unobservable for northern hemisphere observers till the very end of the year when it will be a faint object (~16th magnitude). 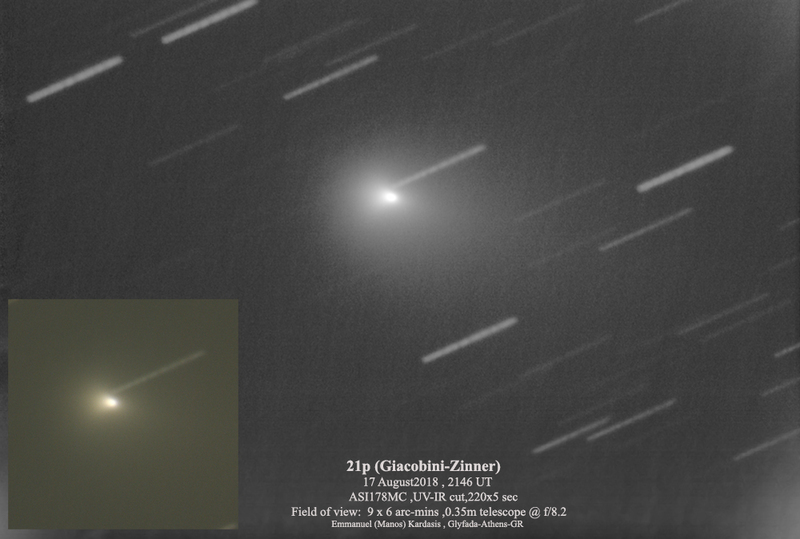 21P/Giacobini-ZInner – Many long-time observers may remember this comet’s last excellent return in the fall of 1985 just as Comet Halley was approaching its 1986 perihelion. This year marks G-Z’s 16th observed return since its visual discovery in 1900 by Michel Giacobini (Nice, France). The comet was visually re-discovered 2 returns later in 1913 by Ernst Zinner (Bamberg, Germany), hence the double appellation. Perihelion and closest approach to Earth both occur on September 10 at 1.01 AU and 0.39 AU, respectively. This will be the comet’s closest approach to Earth since 1959 when it passed 0.35 AU from Earth. Recent observations show that 21P has brightened to magnitude 11.0 to 12.0 by the last week in June. This month the comet is high in the morning sky (for northern observers) as it moves through Cygnus, Cepheus and Cassiopeia. It should rapidly brighten from around magnitude 11 to 10 by the midde of the month and 9 by the end of the month. Its current brightening is still consistent with a peak brightness of around magnitude 7 in early September. Though the comet will be located at high northern declinations over the next few months, it will travel far enough south for most southern hemisphere observers by mid-September. 37P/Forbes - A new comet to the ALPO Comet News, short-period comet Forbes was discovered by South African astronomer Alexander F. I. Forbes on August 1, 1929. 2018 marks the comet’s 15th apparition and 12th observed apparition since discovery. During its last return the comet experienced a 4 magnitude outburst some 9 months after perihelion. This year 37P was not expected to become brighter than ~13th magnitude. Recent observations place the comet anywhere from magnitude 10.3 to 13.6 over the past few weeks. Estimates of coma diameter are also all over the place (from 1′ to 9′) suggesting the comet’s perceived brightness may depend on how much of a low surface brightness coma is being detected by each observer. The magnitudes forecast below are splitting the difference between the late June observations. 48P/Johnson – 48P/Johnson has a large perihelion distance for a relatively bright short-period comet. Perihelion (2.00 AU) and closest approach to Earth (1.01 AU) occur within a week of each other in mid-August making this as good a return as possible for 48P. The comet should brighten from around magnitude 13 to 12 this month as it moves among the stars of Capricornus in the morning sky. This year marks its 11th observed return since it was discovered in 1949 by Ernest L. Johnson on photographs taken at the Union Observatory in Johannesburg, South Africa. Most observers have been consistently placing this comet around magnitude 14.0 which is ~2 magnitudes fainter than expected based on it previous returns. The only dissenter being J. J. Gonzalez who estimates it at the much brighter magnitude of 11.5. J. J. also is seeing a much larger coma so, again, there is some question as to whether a very low surface brightness extended coma is being missed by some observers. 66P/du Toit – This marks 66P’s 4th observed and best apparition since its discovery by South African astronomer Daniel du Toit in 1944. Late June observations place the comet between magnitude 11.0 and 11.5. Now that 66P is past its May 19 perihelion, it should start to fade and this may be the last month to catch it visually. A difficult object for northern observers, 66P finally comes into view for those of us at mid-northern latitudes. The next return won’t be till 2033 though with a minimum comet-Earth distance of 1.36 AU it should be a fainter object at that return. Discovered in 2013 as P/2013 CU129, 364P is making its second observed return. This comet has a rather short period (4.9 years) and is only active for a few months around perihelion. Perihelion occurred last month on the 24th at 0.80 AU from the Sun. Peak brightness will occur a few weeks later closer to the time of closest approach to Earth on July 18 at 0.24 AU. The comet displayed a thin tail in May and June with a hint of a gas coma. Northern observers will be out of luck till early September while southern observers will have an uninterrupted view of the comet (though it will be very low in early July). C/2016 R2 (PANSTARRS) – C/2016 R2 passes through solar conjunction this month. Unless C/2016 N6 which will be too close to the Sun to be seen this month, C/2016 R2 will pass sufficiently far enough north of the Sun that it will always remain visible. During the June, the comet was observed between 11 and 12th magnitude. With a distant perihelion on May 2 at 2.60 AU, the comet should slowly fade. After a few months of no bright comets, May brought a 9th magnitude comet in C/2016 M1 (PANSTARRS). This comet should continue to be the brightest this month though C/2017 T3 (ATLAS) may challenge it. C/2016 M1 (PANSTARRS) – This dynamically old long-period comet was well observed in May with observers reporting it between magnitude 8.5 and 9.6 during the past week. It should continue to brighten by another 0.5 magnitudes this month as it approaches an August 10 perihelion at 2.21 AU. Increasing distance from the Earth after closest approach on June 24 at 1.29 AU will cause a slow fade beginning in late June. Visual observations found the comet to have a fairly condensed coma (DC between 3 and 5) with a diameter between 3′and 5′. No visual reports of a tail have been made though the coma was observed to be slightly elongated. The comet’s 91 degree inclination orbit is resulting in a steady southward motion from a June 1 declination of -24 degrees to -46 at the end of the month. It will be seen moving among the stars of Sagittarius, Corona Australis and Ara. A few close approaches to deep space objects will occur this month (Jun 9 – globular cluster M54 and Jun 12/13 – globular cluster M70). C/2017 T1 (ATLAS) – It is questionable whether or not this comet will be observable and, if so, how bright it will be this month. C/2017 T1 (ATLAS) was discovered by the Hawai’i-based ATLAS (Asteroid Terrestrial-impact Last Alert System) project on October 14, 2017 at 18th magnitude. At the time the comet was located 4.0 AU from the Sun. A dynamically-old short-period comet, ATLAS was brightening at a slightly faster than expected rate (2.5n ~ 11 compared to 2.5n ~ 10 which is usually, and often incorrectly, assumed for all long-period comets). This month, southern hemisphere observers may be able to reacquire the comet as it slowly moves away from the Sun in the morning sky. Since the comet has been out of view since April, its currently brightness is uncertain. Assuming (and we know the old saying about making assumptions) the comet has continued to brighten at its pre-April rate, the comet may be as bright as magnitude 9.4 by the end of the month. Perihelion occurs on July 19 at 0.83 AU though the comet will be a rather distant 1.4 AU from the Earth at that time. With the same caveat about the assumption made above, the comet may peak around magnitude 8.6 around the time of perihelion. For southern hemisphere observers, the comet will be visible at a low elevations (~10 – 15 degrees in July). Unfortunately, it will be unobservable for northern hemisphere observers till the very end of the year when it will be a faint object (~16th magnitude). 21P/Giacobini-Zinner – Many long-time observers may remember this comet’s last excellent return in the fall of 1985 just as Comet Halley was approaching its February 1986 perihelion. This year marks G-Z’s 16th observed return since its visual discovery in 1900 by Michel Giacobini (Nice, France). The comet was visually re-discovered 2 returns later in 1913 by Ernst Zinner (Bamberg, Germany), hence the double appellation. Perihelion and closest approach to Earth both occur on September 10 at 1.01 AU and 0.39 AU, respectively. This will be the comet’s closest approach to Earth since 1959 when it passed 0.35 AU from Earth. Recent observations place 21P between magnitude 13.8 and 15.1 over the last week of May. This month the comet is high in the morning sky (for northern observers) as it moves through Cygnus. It should rapidly brighten from around magnitude 13 to 11 over the course of the month. A peak brightness of around magnitude 7 is predicted for early September. Though the comet will be located at high northern declinations over the next few months, it will travel far enough south for most southern hemisphere observers by mid-September. The brightest report from May was by the Catalina Sky Survey which placed Johnson at magnitude 14.8 on May 21. This is about 1.5 magnitudes fainter than the predicted magnitude. If the comet continues to run fainter than predicted, the magnitudes below may be too bright. 66P/du Toit – Short-period comet 66P/du Toit is still running brighter than predicted. Observers have been estimating it to be between magnitude 10.2 and 10.7 during the last week of May. The comet possesses a large, low surface brightness coma so the comet may appear fainter than expected to some observers. The comet remains a very difficult object for northern hemisphere observers. Personally, I have not been able to acquire it in my 30×125 binoculars due to a combination of its low elevation and a brightening dawn sky. This marks 66P’s 4th observed and best apparition since its discovery by South African astronomer Daniel du Toit in 1944. The next return won’t be till 2033 though with a minimum comet-Earth distance of 1.36 AU it should be a fainter object at that return. 364P/PANSTARRS – 364P/PANSTARRS is an example of a low activity comet. Similar to other comets of this type (such as 169P/NEAT, 249P/LINEAR and 300P/Catalina), 364P is only active at small heliocentric distances. Whether this is due to age, evolution or the possibility that these objects originated in the asteroid Main Belt rather than the Kuiper Belt, is still TBD. Discovered in 2013 as P/2013 CU129, it is making its second observed return. This comet has a rather short period (4.9 years) and is only active for a few months around perihelion. Perihelion occurs this month on the 24th at 0.80 AU from the Sun. The comet displayed a thin tail in May though it didn’t possess much of a coma. CCD and large aperture visual observers can watch the comet approach and pass through perihelion this month. Northern observers will lose sight of the comet mid-month (regaining the comet in early September) while southern observers will have an uninterrupted view of the comet (though it will get very low in early July). C/2016 N6 (PANSTARRS) and C/2016 R2 (PANSTARRS) – In addition to C/2016 M1, there are two other PANSTARRS long-period comets with relatively large perihelion distances visible this month. Both are early evening objects located north of the ecliptic. C/2016 R2 passed perihelion on May 2 at 2.60 AU. It is approaching solar conjunction this month though its location north of the ecliptic means it should remain observable though at low elevations through conjunction. C/2016 N6 reaches perihelion on July 18 at 2.67 AU. The comet will be become a more difficult object to observe as the month progresses and should be lost to most observers towards the end of the month. C/2016 R2 will spend the month around magnitude 11 while C/2016 N6 will be around magnitude 12. Low activity comet (3552) Don Quixote is still designated an asteroid even though Spitzer Space Telescope observations from 2009 showed a faint coma and tail. This month Don Quixote is near its 2018 peak at around 16th magnitude. The object is steadily moving north in the morning sky and is now observable by observers at northern mid-latitudes. Looking ahead, the later months of 2018 will see a few other comets reaching magnitude 10 or brighter. 38P/Stephan-Oterma was observed back in the summer of 2017 by Pan-STARRS at 21st magnitude. CCD observers have recently observed it at 17th magnitude now that it is coming out of solar conjunction. 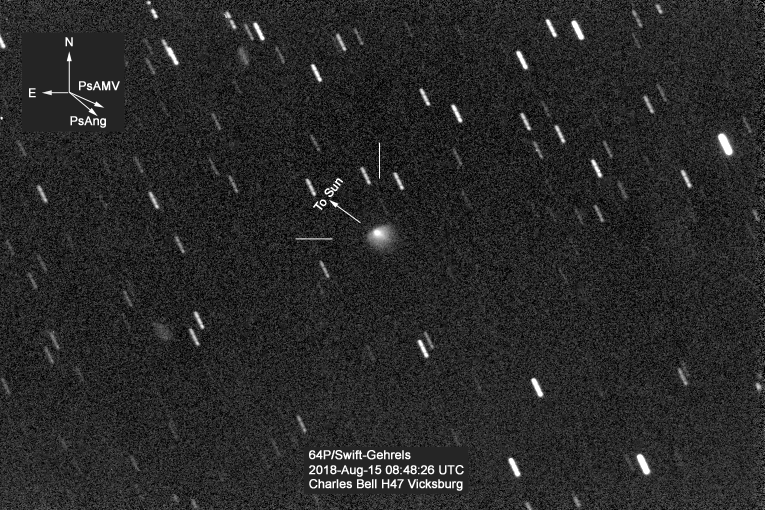 64P/Swift-Gehrels was detected for the first time this apparition by Spacewatch on May 25 UT at magnitude 20.7. What should be this year’s brightest comet, 46P/Wirtanen, was picked up by the Discovery Channel Telescope on May 8 UT at magnitude 20.3. Dynamically new and intrinsically faint C/2017 S3 (PANSTARRS) has shown a very slow intrinsic brightening since its September 2017 discovery (2.5n ~ 5.5!). Perihelion occurs on August 15 at a small distance of 0.21 AU. Though the comet will be located too close to the Sun at that time, there is hope it could become bright (7th-8th magnitude) before becoming lost in the glare of the Sun. In mid-May the comet brightened to 15-16th magnitude. Extrapolating it’s slow brightening trend suggests the comet will not be a bright visual object prior to becoming lost in the bright twilight sky. Then again the comet may brighten at a faster rate, especially if gas-rich, as it gets closer to the Sun. A major question remains as to whether it will be a bright visual object prior to perihelion. Being intrinsically faint and dynamically new there is also a real possibility that this comet’s nucleus is small and will disintegrate at it nears the Sun. May brings our first comet brighter than magnitude 10 since January as C/2016 M1 (PANSTARRS) should brighten to 9th magnitude. An assortment of short- and long-period comets will be between 10th and 12th magnitude this month as well. Also provided are updates on other comets expected to become bright later this year. C/2016 M1 (PANSTARRS) – For the first time since January, a comet is predicted to become brighter than magnitude 10. C/2016 M1 was discovered by the Maui, Hawaii based Pan-STARRS survey on June 22, 2016. At that time the comet was 19th magnitude and located 7.7 AU from the Sun. Since then the comet has brightened to between magnitude 9.9 and 10.8 as reported over the past week. C/2016 M1 is still inbound to a August 10 perihelion at 2.21 AU and should brighten by another magnitude this month to between magnitude 9.0 and 9.5. Due to its 91 degree inclination orbit, the comet will be moving slowly southward from a May 1st declination of -9 degrees to -23 at the end of the month. It will continue to brighten into June though it will become a more difficult object for northern observers as it moves south. 21P/Giacobini-ZInner – Many long-time observers may remember this comet’s last excellent return in the fall of 1985 just as Comet Halley was rapidly approaching its February 1986 perihelion. This year marks G-Z’s 16th observed return since its visual discovery in 1900 by Michel Giacobini (Nice, France). The comet was visually re-discovered 2 returns later in 1913 by Ernst Zinner (Bamberg, Germany), hence the double appellation. Perihelion and closest approach to Earth both occur on September 10 at 1.01 AU and 0.39 AU, respectively. This will be the comet’s closest approach to Earth since 1959 when it passed 0.35 AU from Earth. G-Z may be too faint for visual observation this month. CCD imagers can watch it brighten from 15th to 13th magnitude this month. It will continue to brighten and peak around magnitude 7 in early September. 48P/Johnson - 48P/Johnson has a rather large perihelion distance (2.00 AU) for a (relatively) bright short-period comet. Perihelion and closest approach to Earth (1.01 AU) occur within a week of each other in mid-August making this as good a return as possible for 48P. The comet should brighten from around magnitude 13 to 12 this month as it moves among the stars of Capricornus in the morning sky. This year marks its 11th observed return since it was discovered in 1949 by Ernest L. Johnson on photographs taken at the Union Observatory in Johannesburg, South Africa. 66P/du Toit - The month’s brightest short-period comet appears to be running brighter than predicted. Visual observers have been estimating it to be between magnitude 11 and 12 while CCD imagers have it as bright as magnitude 10. It is possible that CCD imagers are detecting a large faint gaseous coma that is being missed visually. Even though my prediction below has the comet brightening to magnitude 10.3 around its May 19 perihelion (at 1.29 AU from the Sun), the comet may look fainter to most observers. Northern observers may have issues observing du Toit as it is still located far south at declinations of -39 to -31 degrees. This marks 66P’s 4th observed and best apparition since its discovery in 1944 by South African astronomer Daniel du Toit. C/2016 N6 (PANSTARRS) and C/2016 R2 (PANSTARRS) – In addition to C/2016 M1, there are two other PANSTARRS long-period comets with relatively large perihelion distances visible this month. Both are early evening objects located north of the ecliptic. C/2016 R2 passes perihelion on May 2 at 2.60 AU. It approaching solar conjunction though its location well north of the ecliptic means it should remain observable though at low elevations through conjunction. C/2016 N6 reaches perihelion on July 18 at 2.67 AU. C/2016 R2 will spend the month between magnitude 11 and 12 while C/2016 N6 will be between 12 and 13. C/2017 T3 (ATLAS) – Comet Atlas will not be observable from the ground this month as it will be too close to the Sun. It will once again become visible in late June / early July from the southern hemisphere as a 8th-9th magnitude object. In last month’s ALPO Comet News, two low-activity comets were introduced. The first, (3552) Don Quixote, is still designated as an asteroid even though Spitzer Space Telescope observations from 2009 showed a faint coma and tail. This month Don Quixote is near its 2018 peak at around 16th magnitude. The object is steadily moving north through Aquarius and Cetus in the morning sky. The other object is low-activity comet 364P/PANSTARRS. Discovered in 2013, 364P is making its second observed return. This comet has a rather short period (4.9 years) and is only active for a few months around perihelion. It is similar to other usually inactive comets that are only active near or within 1 AU of the Sun (such as 169P/NEAT, 249P/LINEAR and 300P/Catalina). This year perihelion occurs on June 24. If its activity is similar to 2013’s, May should see 364P’s activity ramping up resulting in a 17th magnitude object at the start of the month brightening to 14th magnitude by month’s end. The later part of 2018 will see a few other comets reaching magnitude 10 or brighter. So far no observations have been published for 38P/Stephens-Oterma (peak around 9th mag in Nov/Dec) and 64P/Swift-Gehrels (peak around 10th magnitude in Oct/Nov) by the Minor Planet Center. In the case of 38P this is because it has been close to the Sun though the first observations should come in this month (though still fainter than 18th magnitude). 64P must be fainter than 20th magnitude to not have been seen yet. Dynamically new and intrinsically faint C/2017 S3 (PANSTARRS) has shown a very slow intrinsic brightening since its September 2017 discovery. It will reach a small perihelion distance of 0.21 AU on August 15. Though the comet will be located too close to the Sun at that time, the hope was it would become bright (7th-8th magnitude) before becoming lost in the glare of the Sun. So far the comet has brightened to 17-18th magnitude so there is still some question as to whether it will be a visual object prior to perihelion. Being intrinsically faint and dynamically new there is also a real possibility that this comet is small and will disintegrate at it nears the Sun. Will March be a good month of comet observing? The answer depends on the aperture of your telescope and whether you are a visual or CCD observer. The bad news, unless a surprise discovery or outburst occurs, is that no comet this month will be an easy object for small telescope visual observers. The good news is large aperture visual observers and CCD imagers have quite the varied selection of objects to observe. This month I decided to try a different format for these monthly summaries. I’m hoping the new format makes it easier to quickly identify observing targets. The comets will be broken down into three categories: comets brighter than magnitude 10, comets between magnitudes 10 and 13, and fainter comets of interest. In some cases, the comet of interest may no longer be visible but is the subject of recent research such as this month’s discussion of long-lost (or is it?) D/1770 L1 (Lexell). Information for each comet is now presented in tabular form. This information includes the comet’s designation and name, date of perihelion (T), perihelion distance (q), and type of orbit (JFC for Jupiter family comet with period, HFC for Halley family comet with period, LPC-DO for dynamically old long-period comet, LPC-DN for dynamically new long-period comet). At 10 day intervals, the predicted magnitude, rough J2000 RA and Dec position, heliocentric distance, geocentric distance, elongations from the Sun (E for evening object, M for morning object) and constellation is shown. C/2017 T1 (Henize) – This intrinsically faint comet appears to have survived long enough to reach its February 21 perihelion passage at a rather small 0.58 AU from the Sun. As additional astrometric observations were made, the Minor Planet Center orbits for Heinze oscillated between a dynamically old and dynamically new solution. The latest orbit (released on Feb 28 with positions extending through Feb 12) shows Heinze to be dynamically new. Intrinsically faint, dynamically new objects are prone to fade rapidly after perihelion or even completely disintegrate. This is definitely a comet to keep an eye on. Unfortunately that won’t be easy as the comet starts the month close to the Sun. By the 2nd half of the month, Heinze will be far enough away from the Sun to be more easily seen though by then it may be a difficult visual object and also only visible from the southern hemisphere at that time. While there may not be any comet brighter than 10th magnitude this month, there are quite a few comets between magnitudes 10 and 13. In fact, there are seven comets in that brightness range. C/2016 R2 (PANSTARRS) – The highlight of the bunch remains the ‘blue comet’. No not the famed Jersey Central passenger train, but comet C/2016 R2 (PANSTARRS). This comet is rich in CO+, or the carbon monoxide ion, which gives it a dynamic ion tail and blue color. The comet is still approaching its May 2nd perihelion. Its increasing comet-Earth distance will more than counter the shrinking heliocentric distance so a slow fade should occur this month. Recent magnitude estimates are still scattered but seem to be around 10th to 11th magnitude. C/2015 O1 (PANSTARRS), C/2015 M1 (PANSTARRS), C/2016 N6 (PANSTARRS) – These three comets are similar to C/2016 R2 in that they are all PANSTARRS discoveries and have relatively large perihelion distances at 3.73, 2.21 and 2.67 AU, respectively. Recent observations place M1 at around magnitude 11 to 12.6. The other two are in the 12th to 13th magnitude range. O1 (for part of the month) and N6 (for the entire month) are northern circumpolar objects so both will be invisible for southern hemisphere observers. 62P/Tsuchinshan and 185P/Petriew – Both of these comets are now past perihelion. Making its 4th observed return, 185P/Petriew is now over a month past perihelion and slowly fading from 12th to 13th magnitude in the evening sky. 62P/Tsuchinshan should be fainter as it fades from 13th to 14th magnitude. 66P/du Toit – This year brings the 4th observed return of 66P/du Toit. Discovered in 1944 by South African astronomer Daniel du Toit, the comet was also seen at its returns in 1974 and 2003 but missed in 1959 and 1988. It is currently on an orbit with a 14.7 year period. This return will see its closest approach to Earth since its 1944 discovery apparition. The comet-Earth distance will still be a rather distant 0.90 AU. As a result, 66P may only brighten to 11th-12th magnitude. During its 2003 return, it rapidly brightened in the months prior to perihelion so this month may see the comet start at 17th magnitude and then brighten to 13th magnitude by month’s end. It will be a difficult object for northern observers due to its southern declination. D/1770 L1 (Lexell) – This comet holds a few distinctions. One, it was the first Jupiter family comet to be recognized as such. Two, it holds the record for closest observed cometary approach to Earth at 0.015 AU or 5.8 lunar distances. Three, it was named not after its discoverer but its orbit computer (similar to 1P/Halley, 2P/Encke and 27P/Crommelin). Four, it was discovered by famed French comet hunter Charles Messier. Five, it hasn’t been seen since. Quan-Zhi Ye (Caltech), Paul A. Wiegert (Western Ontario) and Man-To Hui (UCLA) have recently published their investigation into the whereabouts of Comet Lexell. They found that even though the comet has experienced numerous close approaches to Jupiter, there is a high probability that the comet still has a perihelion distance of &lt; 3 AU and a close to even probability of having a perihelion distance of &lt; 1 AU. A search of known comets turned up no possible linkages to Lexell but a search of known near-Earth asteroids did find a few possibilities. The authors identified NEA 2010 JL33 as the most likely object to be long-lost, and now inactive, Comet Lexell. 2010 JL33 is a dark (albedo of 0.047) object with a diameter of ~1.8 km which is consistent with a cometary nucleus. JL33’s next perihelion will occur in July 2019 at 0.71 AU. The object will be faint at 19th magnitude at that time and poorly placed at an elongation of 41 degrees. A pre-print of the paper can be found at https://arxiv.org/pdf/1802.08904.pdf . As always, the Comet Section is happy to receive all comet observations, whether images, drawings, magnitude estimates, and even spectra. Please send your observations via email to carl.hergenrother @ alpo-astronomy.org . Happy New Year! and Welcome to 2018. This year promises to be an exciting year for the Comet Section. New discovery C/2017 T1 (Heinze) is already bright enough for small telescope observers. Later in the year, the following comets should also become nice small telescope targets: 21P/Giacobini-Zinner (magnitude 6 in September), 38P/Stephen-Oterma (magnitude 9 in November), 46P/Wirtanen (magnitude 3 in December), 64P/Swift-Gehrels (magnitude 9 in October/November), C/2017 S3 (PANSTARRS) (magnitude 7 in August though it may get even brighter when too close to the Sun to be observable) and C/2017 T3 (ATLAS) (magnitude 8 in July/August). For large telescope and/or CCD observers, there are many dozens of comets that will become bright enough to observe this year. Continuing our recent ALPO Comet News format, each release will concentrate on comets that are brighter than 12th magnitude. Fainter comets of interest may also be highlighted. This month four comets are expected to be brighter than 12th magnitude for part of the month: C/2017 T1 (Heinze), C/2016 R2 (PANSTARRS), 185P/Petriew and 62P/Tsuchinshan. 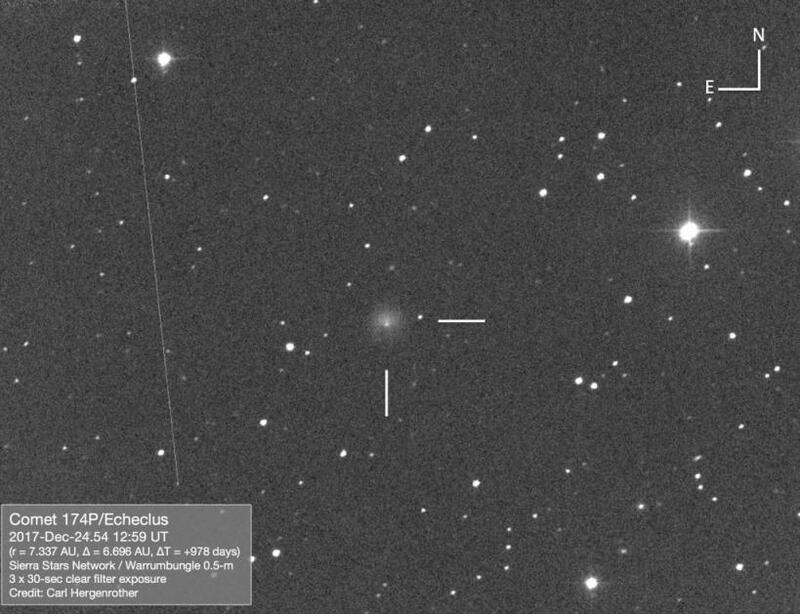 At 13-14th magnitude, distant centaur comet 174P/Echeclus is once again in outburst. The new year kicks off with immediate action courtesy of comet C/2017 T1 (Heinze). As the month begins, you’ll have to battle the first Full Moon of January to see the comet. By the evening of the 2nd or 3rd, there should be enough dark time between the end of twilight and moonrise to grab a quick peak at Heinze. With a closest approach to Earth on January 4 at 0.22 au, the comet should brighten from magnitude 9.2 on the 1st to a peak of around 8.8 a week later. After that the comet will continue to approach the Sun (perihelion on February 21 at 0.58 au) but due to an increase in the comet-Earth distance (from the 0.22 au minimum to 0.79 au at the end of the month) the comet should experience a slow fade to magnitude 9.8 by February 1st. Recent visual observations of Heinze from December 29 UT with 30×125 binoculars under a LM = 6.0 sky show it to be a rather diffuse (5′) low surface brightness object with little condensation or elongation. It is likely that observers under brighter skies and/or using high magnifications/large apertures will see the comet as much smaller and fainter. Even with the bright Moon, CCD imagers may want to observe Heinze during the first few days of January. On January 3rd, the Earth passes through the comet’s orbit plane. As a result, the comet’s dust tail will be seen edge on. While dust tails seem to appear to be 3-dimensional tubes of material, in fact, they are usually 2-dimensional sheets. Similar to Saturn ring plane crossings, comet orbit plane crossings are when we are looking directly along the plane of the dust tail ’sheet’. On the days around orbit plane crossing, the dust tail will appear to narrow and may even grow in length as the surface brightness of the tail increases. CCD and large aperture visual observers will also notice the position angle of the tail rapidly swinging from the SSW on the 1st to nearly due east by the 10th. Comet Heinze was discovered by Aren Heinze with the ATLAS (Asteroid Terrestrial-impact Last Alert System) survey on October 2nd at 18th magnitude. The comet appears to be intrinsically faint. Based on the first few orbits from the MPC, it also appeared to be dynamically new. The latest orbit (released on December 31) make it more likely that Heinze is a dynamically old comet. While faint dynamically new comets have a tendency of not surviving their perihelion passage, faint dynamically old comets should be robust enough to survive. Regardless, all observers are asked to keep a close watch on Heinze as it nears perihelion and to look for any changes in coma morphology that might suggest a splitting or disintegration event. Heinze will be moving rapidly through the northern evening sky this month. It starts the month in Lynx (Jan 1-3) before moving through Camelopardalis (3-6), Cassiopeia (6-12), Andromeda (12-13), Lacerta (14-22) and Pegasus (22-31). Northern observers should be able to follow Heinze into early February before it gets too close to the Sun. After that it will be too far south for northern observers. Heinze might be glimpsed from mid-latitude observers in the southern hemisphere during the first day or two of January. The comet will again become visible to southern observers in mid to late March about 1 month after perihelion. By then the comet will have faded to 11th magnitude or fainter. The ephemeris below (and for all following comets) was produced with Seiichi Yoshida’s ‘Comet for Windows’ program with my best estimate of each comet’s photometric parameters. Comet brightness forecasts are prone to error due to sudden outbursts and changes in brightness trends so don’t be surprised if a comet’s brightness deviates from what is shown below. Also it is suggested that you use your favorite online ephemeris generator or planetarium program to determine exact positions for your time of observation. The image below was taken by ALPO Comet Section contributor Charles Bell on December 29 with a 0.3-m Schmidt-Cassegrain + CCD + R band filter. It consists of 48 x 12 second exposures. Charles maintains a very active and informative Twitter account focused on comet news and observations. I highly recommend it. Comet C/2016 R2 (PANSTARRS) was a bit of a sleeper for much of 2016. A dynamically old long-period comet, it was expected to brighten rapidly as it approached perihelion. Instead the comet intrinsically faded during the first three quarters of 2017. Starting in October, it rapidly brightened from magnitude 14 to 10.7. While not the brightest comet, it has entertained CCD imagers with an intricate and rapidly changing ion tail reminiscent of comets C/1908 R1 (Morehouse) and C/1961 R1 (Humason). All three comets share one trait that may explain their unusual tails, they are all very rich in CO+. The comet is still about 5 months out from its May 9 perihelion at a rather distance 2.60 au. This month its heliocentric distance will drop from 2.93 to 2.80 au. Any intrinsic brightening will be partially countered by an increasing geocentric distance (increasing from 2.07 to 2.29 au). As a result, the comet should only brighten from about magnitude 10.7 to 10.4 this month. It is very possible that the comet may even fade in apparent magnitude if its recent rapid increase in intrinsic brightness moderates. This month PANSTARRS is an evening object spending the entire month in Taurus. Jupiter-family comet 185P/Petriew was a visual discovery by Canadian amateur astronomer Vance Petriew with his 20″ dobsonian while star hopping to the Crab Nebula (M1) at the 2001 Saskatchewan Summer Star Party. 185P/Petriew is on an orbit with a period of 5.5 years and is making its 4th observed return this year. With a perihelion distance of 0.93 au, this comet has peaked between magnitude 9 and 12 at each return. This year it should peak at magnitude 11 around the time of perihelion (January 27) and closest approach to Earth (mid-February at 1.33 au) when located in the western evening sky. It is interesting that this comet was not discovered till 2001. Its perihelion was 1.0 au or less for three returns prior to discovery (1984, 1990, 1996). The 1990 return was comparable to this year’s and the 1984 return was much better. For nearly a 100 years before 1984, it perihelion was larger but not by too much (between 1.21 and 1.40 au). For the current return, few observations of this comet have been reported to, or at least published by, the usual astrometric and photometric archives (MPC, COBS, ICQ, BAA, German Comet Group, ALPO). According to past behavior, 185P should be near magnitude 12.0 at the start of the month and brighten to near magnitude 11.0 by the end of January. Once the Moon leaves the evening sky, it will be interesting to see how bright 185P really is. On January 1, the comet will be located 1.01 au from the Sun and 1.52 au from Earth. These distances drop to 0.94 au from the Sun and 1.36 au from Earth at the end of the month. The comet can be observed moving against the stars of Capricornus (Jan 1-8), Aquarius (8-31) and Pisces (31). Centaur comet 174P/(60558) Echeclus orbits the Sun on a 35 year orbit that carries it from just outside the orbit of Jupiter to between the orbits of Saturn and Uranus. While not quite as outburst prone as 29P/Schwassmann-Wachmann 1, Echeclus has experienced a number of multi-magnitude outbursts since 2006. Brian Skiff of Lowell Observatory discovered a new outburst of Echeclus on December 7. Over the following days and weeks the object brightened to magnitude 13.5 to 14.0. CCD observers continue to image a slowly expanding cloud of dust. The cloud is expected to continue to expand and slowly fade this month. Echeclus is currently an evening object and can be found in Aries (Jan 1-31). I was able to remotely image 174P on December 24 with a 0.51-m telescope located at Warrumbungle, Australia. The telescope is part of the Sierra Star Observatory Network. Discovered photographically in 1965, 62P/Tsuchinshan (Chinese for Purple Mountain which is the name of the observatory where the discovery was made) is making its 9th observed return. The comet was observed between magnitude 10.5 and 11.5 from late October into December. This month, its heliocentric distance increases from 1.48 to 1.62 au while its geocentric distance drops from 1.20 to 1.11 au as it moves through Virgo (Jan 1-31) in the morning sky. The comet should fade by nearly a magnitude over the course of the month from around 11.1 to 11.9.